Dahntay Jones with the huge throwdown on the alley-oop, via NBA. Pippen takes the no look pass from Jordan and throws it down over Antoine Carr, via m3lomanUP. The best part about Hasheem Thabeet getting sent to the D-League is that we get to watch this stiff Hamed Haddadi get banged on even more. This time Gerald Wallace assaults the rim and Haddadi with a vicious throwdown, via NBA. 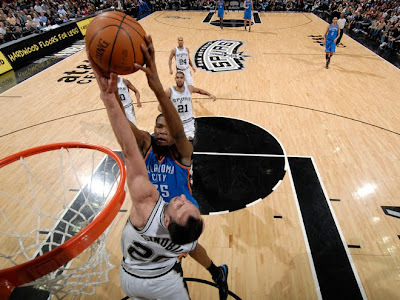 If Durant would have went up stronger with this he would have dunked all over Ginobili, but I think he was surprised that Manu went for the block, via NBA. Nick Young says "Who's your 'dadi?,"via NBA. 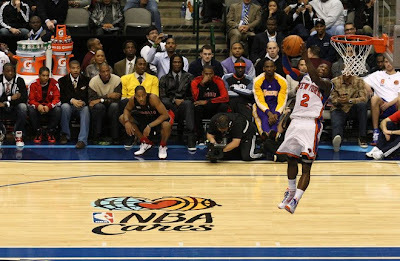 Antawn Jamison with the nasty jam all over the back of David West, via NBA. Check out this Dr. J dunk mix that features some sick poster dunks, via NBA. Dr. J turned 60 today. Brooks Lopez stuffs on Hamed Haddadi, via NBA. 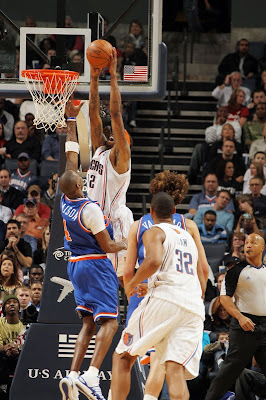 Tyrus Thomas spinnin' and slammin' on Antawn Jamison, via NBA. 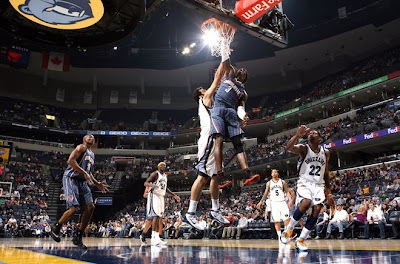 Here's Odom's dunk on Perk from last night, via GoldLakerLion. Every team should have a fan like GoldLakerLion who posts videos on You Tube of their teams best plays. He doesn't miss a Laker highlight. 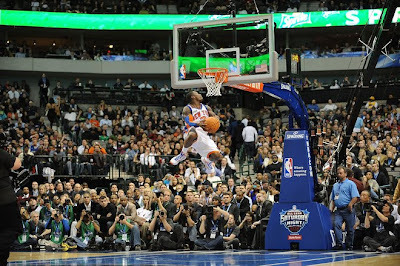 Maybe in his younger days The Matrix could have thrown this down on Amare, but at his current age it ain't happenin'. I think this is the best poster dunk I've seen from Brook Lopez, via NBA.
. The Pistons TV channel has the best slow-mo replays. 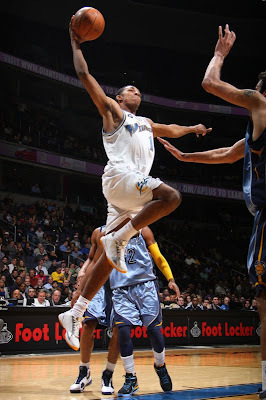 Wilson Chandler reversin' one on Brad Miller, via NBA.
. Hakim Warrick definitely "rocks the spot" when he throws down. 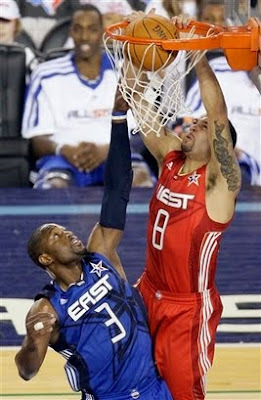 Deron Williams catches the alley on Dwyane Wade, via NBA. Disregard the play-by-play...somehow the timing on the video got all messed up. 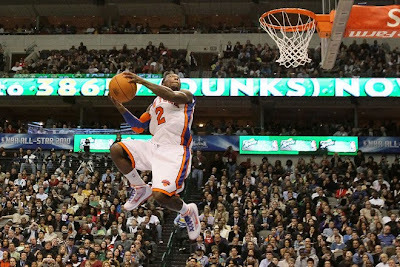 Congrats to Nate Robinson for winning the 2010 Slam Dunk Contest making him a 3-time champion. 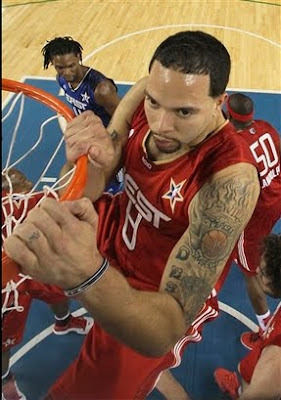 This was his best dunk of the night in what was an uninspiring dunk contest all around.